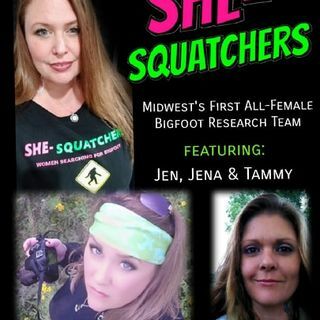 She-Squatchers came together in 2015 to begin their "All Female Bigfoot Experiment," as the Midwest's first all-female bigfoot research team. They aren't just women in the woods, they are psychic women in the woods, utilizing their extra senses on their quest to find and interact with Bigfoot. The team is lead by missing person's psychic medium & remote viewer, Jen Kruse. Her adventurous active team members include: Jena Grover & Tammy Treichel. Together they ... See More have had some amazing experiences, including close calls with rocks being thrown at them from the trees above. They have found evidence which has convinced them that there is definitely something out there! They are literally traveling from coast to coast this year to share what they have found. Definitely!!! Night Alex, definitely live your podcasts!!! GLAD YOU DIDN'T SEE MY COMMENT ALEX LMAO !!! Ladies thank you and Alex thank you for hosting this amazing show.